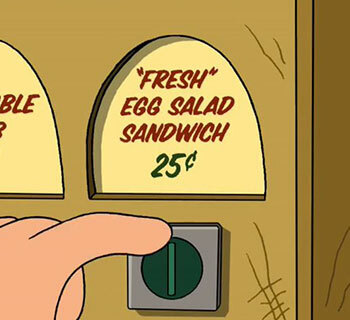 Fry: Hey, you opened up a franchise! Blek’s wife: Yes, our biggest seller is Leela’s Bean Pizza. Six kinds of beans, plus several things that look like beans. 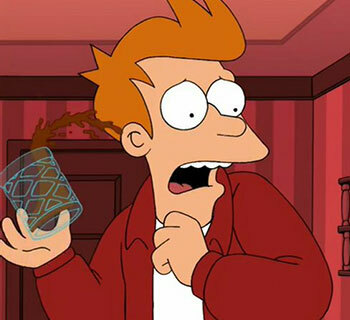 “A Leela of Her Own” is a very uneven episode of Futurama, which starts and ends on some solid notes but is mostly under-cooked in the middle. It’s kind of like a pizza that doesn’t bake long enough, and then you put beans on it. This blernsball-themed episode riffs on a number of baseball tropes and features some memorable guest stars, but is ultimately bogged down a little by an underwhelming character arc for Leela. And perhaps blernsball itself worked better as a one-off gag before we had to look too closely at it. Either way, we’re making Leela’s Bean Pizza! 6 cans of beans: red kidney beans, pinto beans, black beans, great northern beans, garbanzo beans, navy beans. Let’s start out by addressing how odd the ingredients for the dough might seem. I fully understand any hesitancy in making pizza crust from yogurt, but trust me, it is simple and the end result is a crust that tastes like crust. It’s worth trying out. Mix dough ingredients in a bowl until it starts to come together, then knead it on a floured surface for several minutes, until it takes shape. Add a little four if the dough is too sticky. Form the dough into the pizza shape and size you want. The dough will make one medium sized pizza crust. Brush your pizza pan with olive oil and sprinkle with corn meal. Add pizza sauce and spread evenly on the dough with a spoon. Add cheese evenly as desired. As I did not want to ruin an entire pizza, I put the six types of beans on half of it and left the other half plain. If this is cheating, I don’t care. Anyway, I drained each can of beans and placed the beans on the pizza by hand, trying to make sure I got an even amount of each. I choose these six beans because they looked interesting and they weren’t all the same color. 6/10 Delivery Boys. 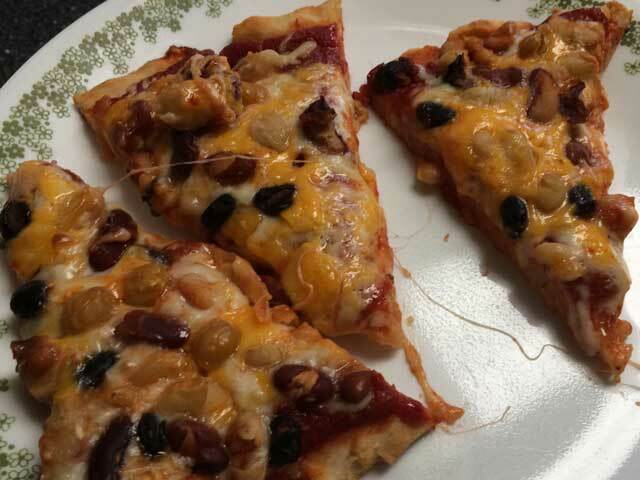 Beans are, in general, fairly bland and starchy, so it didn’t overwhelm the pizza, but it kind of weighed it down and made me not quite as eager to eat pizza. 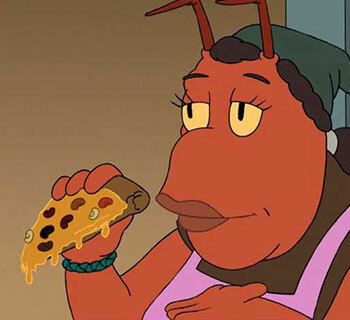 It was interesting to try Leela’s Bean Pizza, but I wouldn’t make it again. One downside to opening six cans of beans at once is that you are left with a large number of leftover beans without much that you can do with them. Even with what seemed like an overabundance of beans on the pizza, I still had roughly 5 ½ cans of beans to deal with at the end of the day. So I rinsed them all off, put them in a bag and froze them, apparently for the apocalypse. Does anyone need any beans? Let me know. The character of Hank Aaron XXIV, descendant of (and voiced by) the home run king, wears an Atlanta Braves jersey in this episode, but his uniform has been updated to feature a trident in the place of a tomahawk. This is a reference to the season two episode “The Deep South”, where we learn that the city of Atlanta is now underwater (but apparently still has a blernsball team). I recently and unknowingly bought an online item from none other than Futurama writer and producer Patric Verrone (he who wrote “A Leela of Her Own”, the episode to which I just gave a wishy-washy review, gulp). The item wasn’t Futurama or Simpsons related, so it was a surprise to see his name in the package’s return address. 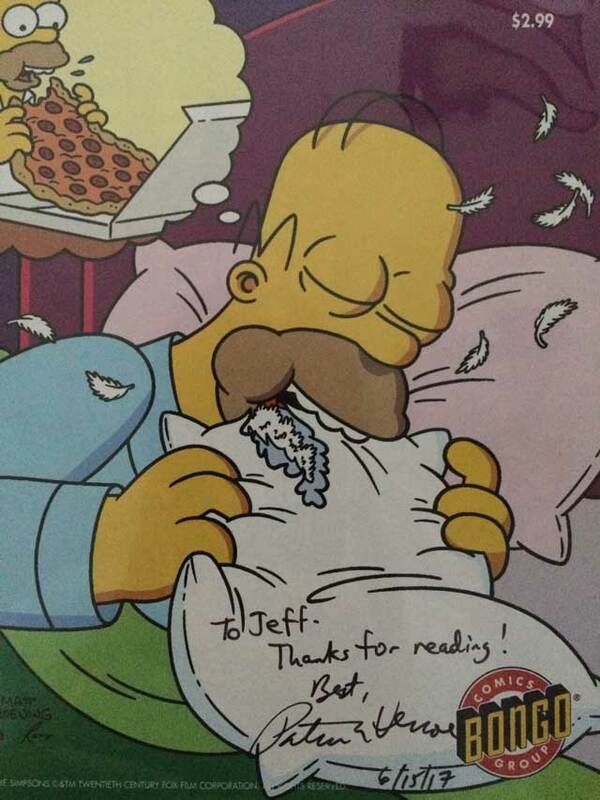 After sending him a weird “hey, I really like Futurama” message, I went back to his store and bought some issues of Simpsons Comics that he wrote, and before the restraining order came in, he even signed one to me (coincidentally, Homer is eating pizza on the cover). It was an interesting way to meet someone whose work I admire. And lastly, I’ll once again be traveling to Comic-Con International in San Diego; the show this year will be from July 19-23. If you’re at the convention, feel free to stop by and say hi, or to discuss cartoon food recipes. I’ll be at booth M-06 and at the New England Comics booth, 1807 throughout the show. 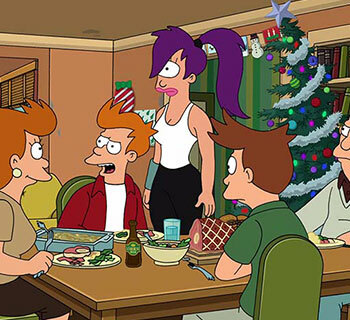 I fully expect to hear some (good) news (everyone) about new Futurama content, as hinted recently by executive producer David X Cohen. Jeff lives in a hollowed-out tree stump in the wilds of Pennsylvania. He writes comics, and, I guess, tries out cartoon and comic book-inspired food recipes. Find him at teddyandtheyeti.com, franksandbeansonline.com, and directly behind you as you close your medicine cabinet mirror. Honestly I’ve heard of yogurt bread before so your choice of using that for dough, while interesting, wasn’t that weird to me. And if I’m not mistaken it saves you from having to do that tedious yeast and waiting for dough to rise for general breadmaking right? And as far as your bean situation goes you could probably soak em in barbeque sauce and heat em up or something. And I’m surprised you didn’t mention, “Bean-Bay Beans. They’re the beaniest.” (or the spanish version) here. And I guess I’ll end this long comment by saying have fun at Comic-Con. That’s true about Bean-Bay Beans – I’ll be sure to pass this comment along to Jeff for such a glaring oversight!